Kammok Wallaby Hammock. The Kammok Wallaby allows you to pack, travel, and hang virtually anywhere. Weighing in at 10 oz, its sleek body, silky fabric, and packable design make the Wallaby your ultra-portable, ultra-light hammock, ready for any adventure, big or small. 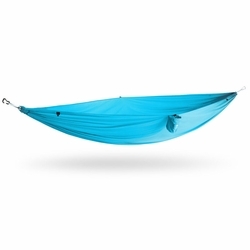 Weighing in at 10 oz, this hammock is lighter than a hamster and holds more than a baby elephant. Take adventure with you, without the bulk. Included 13 kN Mini Kanga Claws and Racer Slings provide superior suspension for added security and safety while hanging. The new 40D Diamond ripstop nylon fabric, is incredibly strong and ultra-packable. Dimensions	4' 2" x 8' 4"
Packed Size	5.5" x 3.5"